This example shows you how to write to several files at once in Java using the MultiWriter class. The demo code creates some test data in memory and uses a MultiWriter to write it to both a CSV file and Excel file using a single method call. However, other readers/writers can be used instead of or in addition to CSVWriter and ExcelWriter. Please refer to open and close several readers/writers at once which shows how to open/close several readers/writers in a single method call. Two Record objects are created in memory with the fields name and balance set to some test values. A RecordList is created and these Record objects are added to it. A new CSVWriter is created corresponding to the output CSV file credit-balance-03.csv. 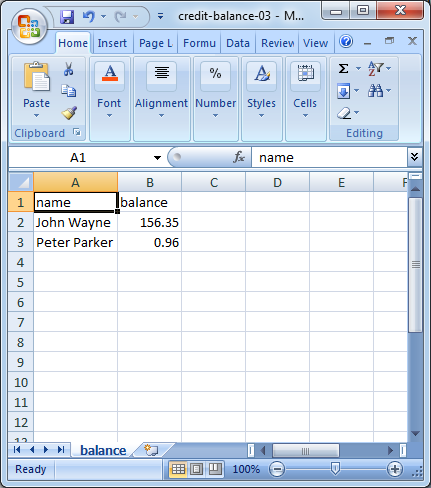 ExcelWriter and ExcelDocument classes are created corresponding to the output Excel file. A new MultiWriter class is created and the CSVWriter and ExcelWriter classes are added to it via the MultiWriter.add method. Data is transferred from memory to the output CSV file and Excel file via JobTemplate.DEFAULT.transfer method. A MultiWriter class can be used to write to several output files at once. It has an add(DataWriter) method using which several destination writers can be added to the MultiWriter. Writing any output to the MultiWriter internally writes data to the target writers.